Alzheimer's can be difficult to understand for those who do not suffer from the disease. A senior living center in Kentucky is trying to help caretakers of those diagnosed with the condition better understand it with a tour, according to NBC affiliate WAVE. 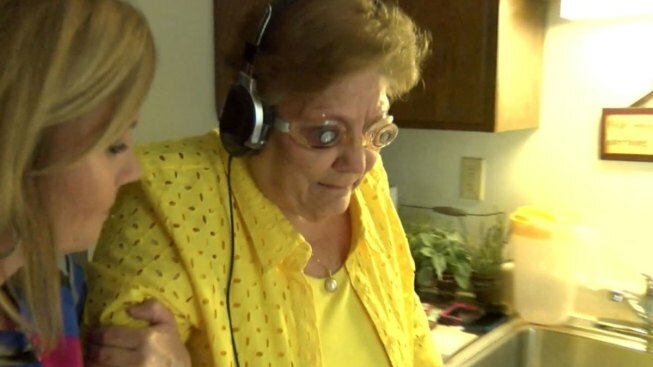 The "virtual dementia tour" clouds a person's vision and hearing with goggles and background noise. It also impairs functions like use of your fingers to simulate arthritis. For the simulation, people are told to wear gloves with some of the fingers taped together to simulate arthritis. They also told to wear headphones with headphones that provide noises that make it difficult to hear to simulate impaired hearing. They are then asked to complete simple tasks in a dark room, like run a belt through the loops of a pair of pants. As seen in the video above, it is challenging for people who would otherwise find the task easy. Brenda Loy, of Louisville, began crying after the experience, telling WAVE that it helped her understand the disease’s toll on her husband, James. The couple has been married for 53 years. "(The simulation) opened my eyes in a good way for me to see, but in a bad way to know my husband deals with that every day and there's not a thing you can do about it,” Brenda Loy said. "You just have to let it run its course." Watch the simulation in the video above.